This reproduction shirt has the cut of a 60s style shirt, but the fabric is more reminiscent of the disco era. 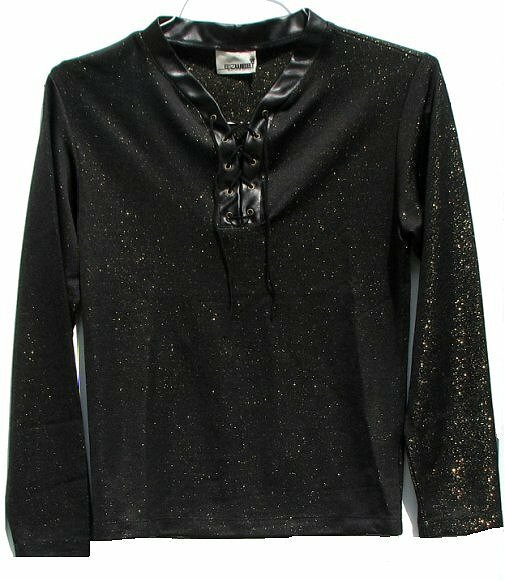 It is made out of a thin black polyester knit that has gold lamé (metallic) thread in it. The sparkly fabric is very soft. It shouldn't snag. The cut of this is for either a S-M short guy or an adolescent perhaps. The chest would look best on a 32 - 34 inch chest. The arm length is 29". Typical shipping arrival time on this is 2-5 days.